This entry was posted in Uncategorized by Joanne. Bookmark the permalink. Joanne, it’s another great make. Though I am not a fit expert, I have similar issues as you at the back. You could try with a sway back adjustment or darts may fix that (I usually need the darts rather than swayback). Though I normally make different patterns all the time I think your approach is much better as in the end you achieve better fit. Oh my God, Joanne, this is great. I totally get the Coco addiction. Just finished my first one and I can’t wait to make a ton more. I only have the side seams basted so far, but I love it so much that I had to wear it to work immediately, and just pray it doesn’t fall apart. 🙂 As for other multiple makes, I’m up to four pairs of Colette Clovers and at least four Macarons. Great work. Can’t wait to see more of your Cocos! I can’t believe you wore a dress that was only basted. That is addiction! It managed to stay together all day. Just lost about a half inch off one wrist. A woven wouldn’t have been so forgiving. Spooky! I just logged on to look at my Coco instructions for the cuffs and there you were showing your ones off. 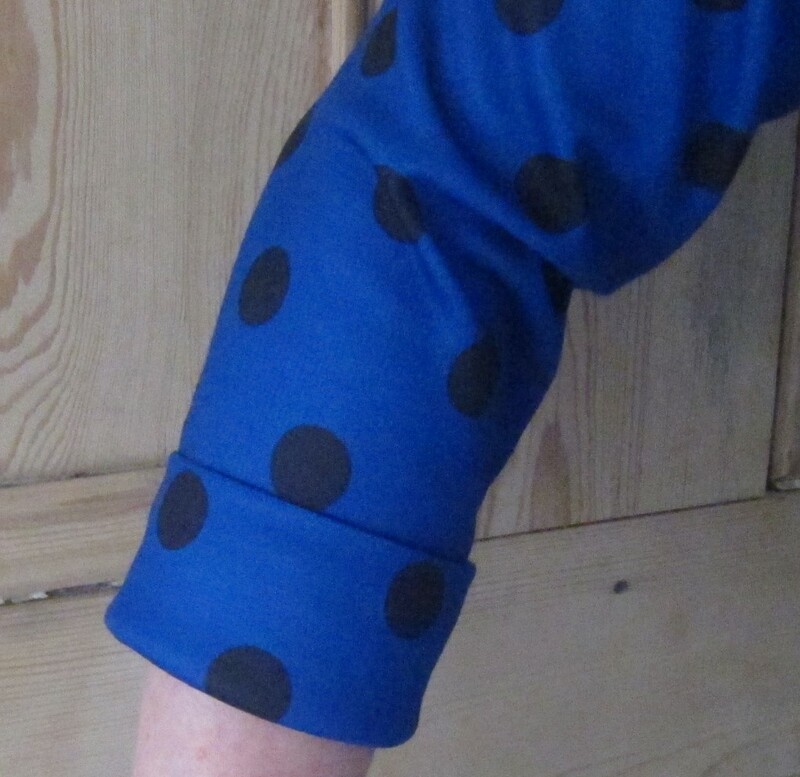 In my experiments with jersey, as I like to call my dressmaking efforts, I have found that there are so many different knits out there it seems to depend on what you choose as to how it fits you. 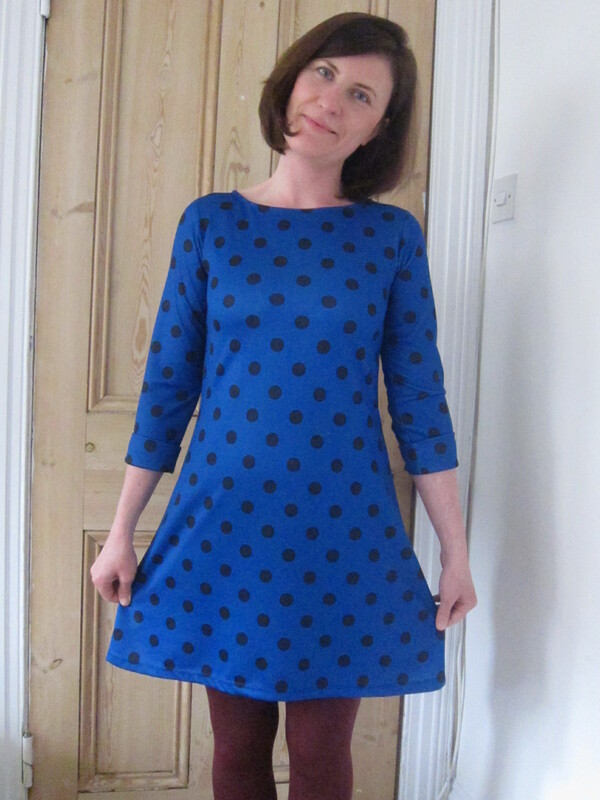 The one I’m using at the moment is a dream – double knit, stable and not that much stretch – but I was able to have a feel of it as I bought it ‘in real life’ and not online. I wasn’t that confident with the size so I basted it together with the ordinary machine first so I could check the size before I put it through the overlocker as once that blade has connected with the seams, there’s no going back. I have tried it on and it is too long – erring on the side of caution again – but I won’t be going quite as short as you as I’m not as young as you and tongues would wag. 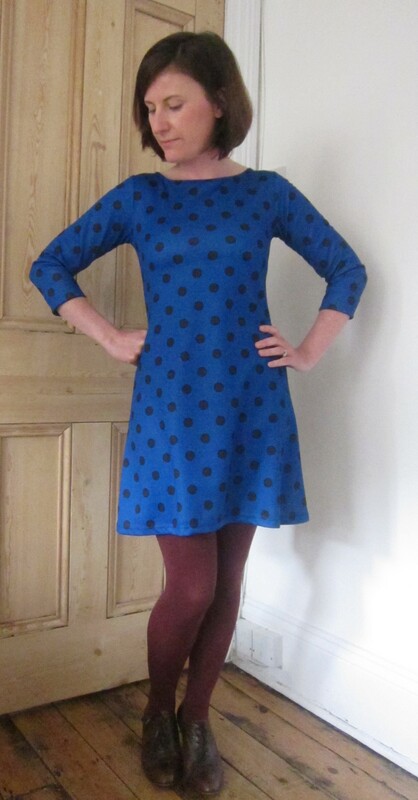 I will be making more of this pattern but I am also a fan of the Lady Skater dress (more jersey!) and, today, I belatedly discovered the Colette Sorbetto blouse which is a free download and made it up in a Liberty tana lawn and, even though I added little sleeves, as nobody wants to see my underarms any more, it was quick and easy and is a really sweet little summer top as well as being a great stashbuster – you could probably squeeze one out of a metre. I was going to do a blog post on them both but I appear to have done one here – sorry about that! Love the bedtime Coco in the previous post too. My only tips are to make it as shallow as you can and take it slowly! Wow, this is cute, too! I love it on you!!! Loving your new Coco! I’m in the middle of Coco number two, I’ve just finished Sassy Librarian blouse number three, and I’m going to start Deer and Doe Airelle number three. I love a TNT pattern! This dress looks awesome. I just love polka dots. Thanks for sharing. I know I am very late to the game, but, I am a beginning sewer. I just bought the Coco! pattern and fabric and can’t wait to try it. (And yes, I include an exclamation mark whenever I say Coco!) I want them in many colors and lengths. Thank you for your post. Not sure if you tested your pattern changes, I would love to see! just coming over to say hello. how are you darling?